Dogs With a Drug Problem: MDR1 mutation affects more than just Collies – and involves more drugs than ivermectin. Genetic Mutation Causes Sensitivity to Multiple Drugs. Most dog owners are aware that Collies and other herding breeds may be sensitive to ivermectin, used for heartworm prevention and to treat certain parasites. But did you know that these dogs can also be sensitive to a number of other drugs, and that other breeds can also be affected? It’s been known since 1983 that ivermectin can cause neurologic toxicity in some, but not all, Collies. In affected dogs, toxicity is caused by doses of ivermectin that are 1/200th of the dose needed to cause toxicity in normal dogs. Symptoms of neurologic toxicity can include uncoordination or loss of balance (ataxia), depression, disorientation, excess salivation, pupil dilation, nystagmus (abnormal movement of the eyes), blindness, tremors, recumbency (inability to get up), coma, respiratory compromise, and even death. But the next big accomplishment in gaining an understanding of exactly what was responsible for the toxic effects of ivermectin in some dogs came in 2001, when Katrina Mealey, DVM, PhD, DACVIM, DACVCP, at Washington State University College of Veterinary Medicine, identified a mutation in the MDR1 gene that causes ivermectin sensitivity. The discovery led to WSU’s development of a test that can detect the mutant gene, so that dogs who are susceptible to this toxicity can be identified. Dogs can have either two copies of the defective gene (homozygous, double recessive), or one defective gene and one normal gene (heterozygous). Dogs with two copies will be most severely affected. Dogs with one copy are less sensitive (able to tolerate a higher dose before adverse effects are seen), but they are more sensitive than normal dogs. The MDR1 mutation allows drugs to build to toxic levels in the brain, and is now referred to as “multidrug sensitivity.” Toxicity may occur from a single high dose or frequent low doses of problem drugs. Topical application of certain drugs can also cause toxicity, and the effects may last longer, but it generally takes higher doses. WSU is the sole patent holder for the test to detect the mutant gene. The test requires only a simple, non-invasive cheek swab that you can collect yourself and send to WSU’s Veterinary Clinical Pharmacology Laboratory (VCPL). The test costs $70 (as of April 2015), with a discount for more than four dogs. It can be performed on any dog, including mixed breeds, at any age after weaning. The test will identify whether a dog has one or two copies of the defective gene. It takes about two weeks to get results. Update: Mars Wisdom Panel 2.5 and 3.0 Canine Genetic Tests now include a test for the MDR1 mutation, along with your dog's genetic background. Cost is $85 as of April 2015, with a discount for shelters. All heartworm preventive medications can affect dogs with the MDR1 mutation, including ivermectin (Heartgard), milbemycin (Interceptor, Sentinel), selamectin (Revolution), and moxidectin (ProHeart, Advantage Multi). The very low doses used for heartworm prevention, however, should not cause any harm, even to dogs with two copies of the defective gene. The higher doses of these medications that are used to treat demodectic mange, sarcoptic mange, ear mites, and other parasites, however, should be avoided in all affected dogs. Generic ivermectin preparations such as Ivomec 1% solution should not be given to affected dogs, as the potential for toxicity from the wrong dosage is too great (the instructions on many websites result in dosages at least 10 times too high; see Ivomec Dosage Instructions for correct information). Long-acting injectable products such as ProHeart 6 may also be problematic for affected dogs. Toxicity can also occur from eating the manure of other animals, such as horses or sheep, after they are treated for parasites with products containing ivermectin. Pesticides with ivermectin used to treat a home or yard may cause toxicity if an affected dog is exposed to the area afterwards. Toxicity has been seen in affected dogs receiving oral doses that were 30 times the heartworm preventive dose of moxidectin and 10 times the regular dose of milbemycin. Selamectin caused toxicity at 2.5 times the recommended dose when that amount was given orally, but higher doses are tolerated when the product is applied topically, as directed. Spinosad, a flea-control medication included in Comfortis and Trifexis (also called Vethical AcuGuard and ComboGuard), increases the risk of neurological toxicity even in normal dogs when combined with high doses of ivermectin (and possibly other drugs) used to treat parasites. While theoretically safe, use caution when combining Heartgard or other ivermectin heartworm preventive drugs with products containing spinosad for affected dogs. Do not combine high doses of ivermectin with spinosad for any dog. Drugs that are known to affect or may affect dogs with the MDR1 mutation include some used to treat cancer, pain, parasites, bacterial infections, diarrhea, vomiting, and anxiety, as well as pre-anesthetic drugs. In addition to ivermectin, the most commonly used problem drugs are acepromazine (Ace), butorphanol (Torbutrol, Torbugesic), and loperamide (Imodium). Most of these drugs require a prescription, but loperamide, an anti-diarrheal medication, is available in over-the-counter preparations. Ideally, only dogs with no copies of the MDR1 mutation would be used for breeding. This may not be feasible or even optimal in some cases, however, particularly in heavily affected breeds, where the rest of the gene pool would be too limited, which leads to other problems. Any dog with the mutation may pass it along to their offspring, but dogs with just one copy of the mutation can also produce normal puppies, particularly when bred to dogs that do not carry the mutation at all. In this way, the population of affected dogs can be reduced through subsequent generations. Even if you don't plan to breed, all dogs from affected breeds should be tested for the MDR1 mutation for their own protection. Mixed-breed dogs from affected breeds or whose parentage is unknown should also be tested, as it’s impossible to tell for sure just by looking at a dog what its ancestry might be. Before the genetic test became available, vets often repeated the adage, “White feet, don’t treat!” as a reminder that such dogs might be at risk, since many herding breeds and mixes have white feet. This is not reliable, however, as some dogs with white feet may have normal genes, and dogs with non-white feet may be affected by the mutation. Dr. Mealy recommends testing all mixed-breed dogs with unknown breed status, as one exposure to a drug to which they are sensitive could be fatal. “The biggest problem I have seen with MDR1 mutants is accidental exposure by owners who were unaware of the problem,” says Dr. Best. “I have seen several dogs die from this problem after being exposed to ivermectin products. If tests show that your dog is affected by the MDR1 mutation, or if your dog could be affected and has not been tested, make sure that your vet is aware of potential drug sensitivity. You may want to give your vet a copy of the list of drugs from the VCPL website to include in your dog’s file. Be sure to remind your vet of the situation any time that your dog needs to be anesthetized or sedated so that the wrong medications will not be given. If you use any drug that might cause toxicity, start with low doses and gradually increase the amount that is given over a few days as long as no adverse side effects are seen. Continue to monitor your dog closely for signs of toxicity, particularly when the drug is given daily, as chronic toxicity caused by cumulative effects could develop. If your dog shows signs of toxicity after applying a topical product, immediately bathe your dog with soap to remove as much of the product from the skin as possible. Update: Intravenous lipid emulsion (ILE) has been proposed as a possible treatment for ivermectin toxicosis. This is a relatively new treatment for treating toxicosis of various lipophilic drugs and is only used after traditional therapy has failed. A veterinary specialty practice or vet school would be most likely to have access to this therapy. See A potential new treatment for ivermectin toxicosis, and more for more information. Continued research led to the discovery that the same genetic mutation affects more than just Collies. The MDR1 mutation has been found in herding breeds and sighthound breeds. Mixed-breed dogs can also be affected, even if they don’t look like herding breeds. 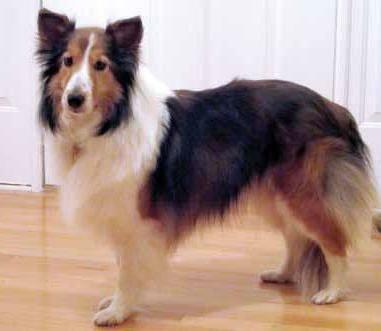 A 2004 study found that the mutation is most common in Collies, affecting almost three-quarters of dogs in the United States, with more than 30 percent being homozygous (two copies of the defective gene) and more than 45 percent being heterozygous (one copy). Longhaired Whippets were next, with about 65 percent affected dogs. The problem is also common in Australian Shepherds (50 percent) and McNabs and Silken Windhounds (30 percent each), with other breeds being less commonly affected. See the table below for more information about frequency of the MDR1 mutation (homozygous and heterozygous) in breeds from the 2004 study, and updated information on the approximate overall frequency of affected dogs from VCPL (the numbers will not add up since they come from two different sources). The mutation has not been found in several related breeds, including the Anatolian Shepherd, Australian Cattle Dog, Bearded Collie, Belgian Tervuren, Borzoi, Greyhound, Irish Wolfhound, and Kelpie. * Frequency in white German Shepherd Dogs is greater than in those of other colors. Doxorubicin, vinblastine, and vincristine: Chemotherapy drugs. Affected dogs are more likely to suffer from bone marrow suppression and gastrointestinal side effects. Dosage should be reduced up to 50 percent and dogs closely monitored. Ivermectin (Ivomec), milbemycin, moxidectin, selamectin. Safe when used at low heartworm preventive doses but should not be given at the higher doses used to treat other parasites. Advantage Multi has been approved in Europe for topical use in treating demodectic mange and was shown to be safe for affected dogs at recommended doses (applied once a month). Digoxin (Digitalis). Used to treat heart disease. Morphine, buprenorphine (Buprenex), fentanyl. Opiates used to treat pain. Cyclosporin (Atopica). Immunosuppressive drug used to treat allergies and autoimmune disease. Domperidone. Used in Canada and elsewhere to improve gastric motility. Etoposide, mitoxantrone, paclitaxel (Paclical Vet). Chemotherapeutic drugs. Ondansetron (Zofran). Used to stop vomiting. Rifampicin, Rifampin. Used to treat bacterial and fungal infections. Grapiprant (Galliprant). Newer NSAID (non-steroidal anti-inflammatory drug) in the piprant class, touted to be safer for dogs who cannot tolerate other NSAIDs, though that claim is questionable. Grapiprant is a substrate of P-glycoprotein transport. No information available about its effect on dogs with either one or two copies of the MDR1 mutation. Flea and tick control medications have not been found to cause adverse effects when used as directed, but toxicity can occur if topical products are ingested. Advantage Multi, which combines imidacloprid for flea control with moxidectin for heartworm prevention, was found to cause no side effects when applied topically to affected dogs even at 5 times the recommended dose, but ingesting less than half the recommended topical dose caused extreme toxicity leading to coma in four of five dogs. Veterinary Clinical Pharmacology Laboratory, College of Veterinary Medicine, Washington State University, Pullman, WA, (509) 335-3745. Mars Wisdom Panel, 888-K9 Pet Test (597-3883). Tests for the MDR1 mutation as well as your dog's genetic background. Melissa Best, DVM, Apex Animal Hospital, Helena, Montana (406) 449-4455. Can Vet J. 2006 December; 47(12): 1165–1168. Breed distribution of the nt230(del4) MDR1 mutation in dogs. Vet J. 2011 Jul;189(1):67-71. Epub 2010 Jul 23. Proc Natl Acad Sci U S A. 2004 Aug 10;101(32):11725-30. Epub 2004 Aug 2. Treatment of MDR1 mutant dogs with macrocyclic lactones. Curr Pharm Biotechnol. 2012 May; 13(6): 969–986. J. vet. Pharmacol. Therap. 28, 545–551, 2005. Compendium on Continuing Education for the Practicing Veterinarian. Pp. 23-33. Bonagura, John, and David Twedt, Ed. Kirk's Current Veterinary Therapy XIV. Saunders/Elsevier. 2009. Pp. 125-127. See excerpts in the second post at the GardenWeb forum.